Sunday December 17th 1893 After I finished my work Will took me over home on the buggy and he went on out to Woolfs. I had a good visit at home. he came for me about four oclock. I got us a little supper and we spent the evening at home reading. weather very cold and chilly. Monday December 18th 1893 weather milder. I did the washing alone and washed windows in the back part of the house. The wind grew strong and colder in the afternoon. Will spent all day in the valley hauling wood out of the timber. He left the sled and came home on horse back. I read all the evening. 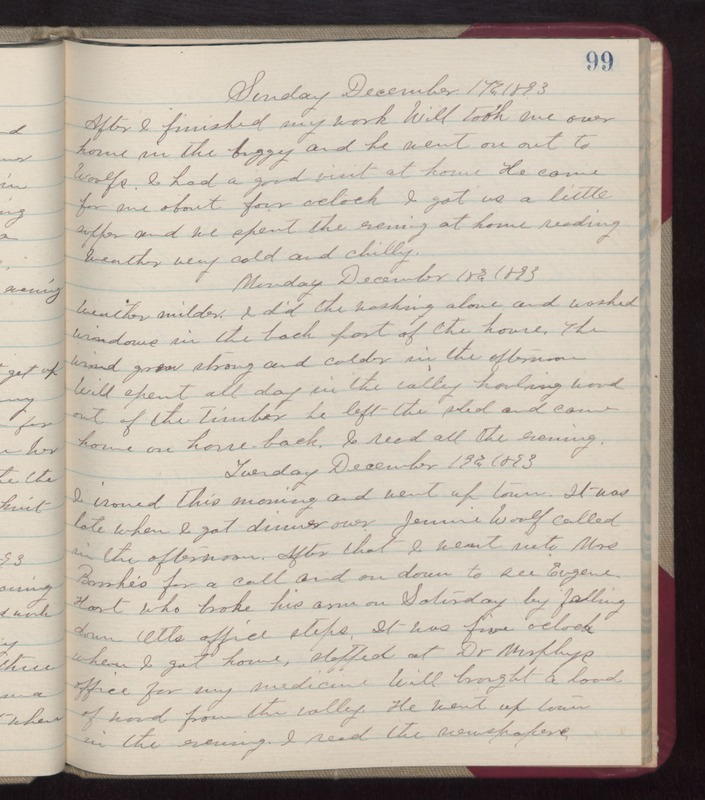 Tuesday December 19th 1893 I ironed this morning and went up town. It was late when I got dinner over. Jennie Woolf called in the afternoon. After that I went into Mrs [Brushe's?] for a call and on down to see Eugene Hart who broke his arm on Saturday by falling down Otts office steps. It was five oclock when I got home, stopped at Dr Murphy's office for my medicine. Will brought a load of wood from the valley. He went up town in the evening. I read the newspapers.